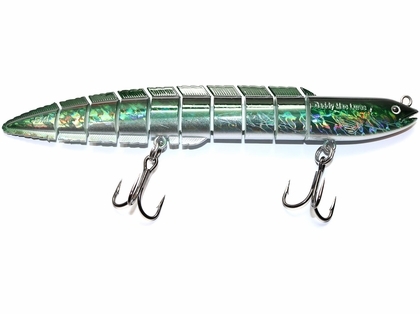 Daddy Mac Viper Eel 9" Lures feature a truly lifelike swimming action. Daddy Mac Viper Eel 9'' Lures feature VMC 4x strong treble hooks, and an unprecedented 11 Kevlar linked splits to produce a truly lifelike swimming action. Fast sinking, clacks when swims, and has an internal rattle. 3D eyes, reflective durable finish, and ABS hard plastic construction.